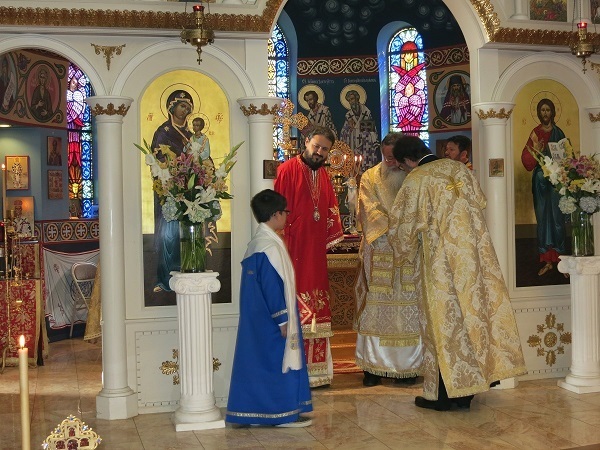 San Francisco, CA - On Sunday, October 5, 2014, the St. John the Baptist Serbian Orthodox Church in San Francisco celebrated their 60th Anniversary with the Holy Hierarchical Divine Liturgy served by His Grace Bishop Maxim of Western America and His Grace Bishop Longin of New Gracanica and Midwest Diocese. Concelebrating clergy were, Fr. Slobodan Jovic, Fr. Vasilije Cvijanovic, Fr. Marko Matic, Fr. Zoran Savic and the host priest Fr. Djurica Gordic. Also present were Fr. Dusan Bunjevic and Deacon Triva Pavlov. Before the liturgy Darko Vujetic, who for many years has been helping in the altar during services, was ordained a Reader. Besides many parishioners attending the service also in attendance were parishioners from neighboring parishes and beyond such as Jackson, Los Angeles, Moraga, Saratoga and Oakland. Following the liturgy a formal banquet was held during which Archpastoral Gramatas were presented to deserving individuals from the parish. Dear brothers and sisters, our beloved Children in the Lord, Allow me first to express my profound joy to see you all gathered together for the celebration of sixty years of existence of St John the Baptist Serbian Orthodox Parish in San Francisco, California. For sixty consecutive years our parishes on the West Coast have testified to our purpose: to build and expand our Orthodox Faith on this blessed Continent, with determination, hope and Christian love. It is my belief that only an organic unity between all the “charismata” or “orders,” in the Pauline sense of the word—the clergy and laity—can bring spirit and quality to this blessed country. The unbroken unity of the people of God and the voice that resonates the Eucharistic dialogue should be the mission of each parish, which it will achieve in a most superb way not as another objectified social structure—since the Church is not a democracy—but as a charismatic event of communion within the Church. As an Orthodox bishop, I cannot but rejoice at the emergence of such voices principally when they stem from the inner being of the local Eucharistic gathering. If we want to do justice to the Church, we have to appreciate the laity, as those in fact who finally implement all progress and growth in the Church’s life. When a priest is gifted with a charisma of the eucharistic transfiguration of the world then the faithful will become part of the process of reshaping of the parish life, rather than only being involved solely in Sunday gatherings. Ecclesial ethos is result of eucharistic and sacramental manifestations of the Church and of the cooperation between priests and the faithful. A parish that does not refer to the Person of Christ is a parish that refers to the corrupted world. Our attentiveness toward the existential realities of American life is the condition sine qua non of our authenticity. Only by an empathetic approach to the anxieties, sufferings, and problems of others, i.e., the neighbor of the Gospel, can we effectively bring the theory (theoria) of the new reality of inter-Orthodox relations on this continent to the light of the day. May this Jubilee which we commemorate in San Francisco as well as the Commemorative Book marking the sixtieth anniversary of the establishment of the Serbian Orthodox Parish of St John and the gathered documents and testimonies therein, remind us all of the zeal of our ancestors and guide us to the sacred goal of unity in Christ and His Orthodox Church.